Another pastel Christmas card from me – I’d forgotten just how much I love pink and grey together. And super cute Dolly December from Whimsy Stamps was made for pink and grey! I coloured her up with a combination of copic markers and pencils, sorry no list of colours today, I just grabbed pencils willy nilly to get the shades to match the paper. I love her hair, so pretty. I think the fresh white flowers work so well with the pastel background. I seriously can’t get enough of the adorable mice from Di’s Digi Stamps. This darling little image is called Candle Light. I’m tyring to use some of my older dies that never see the light of day. Such a shame that there are some beauties hidden at the back of the boxes. The border die is a My Favourite Things (I think) and the circle die is Quickutz. I love blue and white for Christmas cards, always so fresh and pretty. For this week’s Whimsy Stamps DT card I’ve used the sentiment from the Clearly Scripty Occasions stamp set, along with snowflakes from the Elegant Snowflakes die set. I picked up this paper pad from The Range last week, it’s called Wonderful Christmas by Craft Sensations. Before die cutting the ivy leaves (Marianne Design die) I painted a piece of white card with Platinum Starlights paint. Oh my goodness, this paint is luscious. The little glittery berries are part of a large leafy spray, also from The Range in the post Xmas sale last year. And did you see that fab gold and white twine sneaked in there again? I can’t leave this stuff alone lol. The Scrapinec chipboard Baubles are a double layer set, I painted them with white acrylic before adhering them together then slathering on Distress Glitter. I LOVE making Christmas cards, you can never use enough bling – I think I was a magpie in a former life lol. I’m still working through the stuff that I have duplicates (and even triplicates!!) of, some are still in the packaging the order was delivered in! I’m so bad, so so bad! I have a spare Tim Holtz Idea-ology Holidays Past 12x12 paper pad to give away. As always, just leave a comment and I’ll draw a winner in a few days. It’s the last day of the October Whimsy Stamps release, so don’t forget to pop across to join in the fun over in the Whimsy Stamps and Inspirations Facebook group and hopefully win a prize. I’ve used another Clearly set for today’s card, this one is called In my backyard. Once again I’ve used that gorgeous Winter Wishes paper pad and matching Winter Wishes Enamel Dots, the colours are divine. I layered up Double Scallop Layered Doily die behind the image. 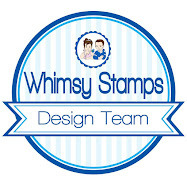 Hope you’ve been inspired by all the fab creations that have been posted on the Whimsy Stamps facebook page. It’s day 2 of the October Whimsy Stamps release, with the party over in the Whimsy Stamps and Inspirations Facebook group still going strong. I’ve used the sweet little Snowman and Robin for today’s card, along with the fabulous Winter Wishes paper pad and matching Winter Wishes Enamel Dots. For the UK ladies - Noor Design is stocking the new Whimsy release here. I stamped the new Clearly Criss Cross Flowers background stamp onto white card and heat embossed with white detail embossing powder then rubbed several different shades of Distress Ink over the piece to get the smoky blue to match the background paper. I love this resist technique. I used a sentiment from the Clearly Holiday Sweet Treats stamp set – I love this set, the font is gorgeous. I made the poinsettias using the Build a Poinsettia die set that was released last month. I adhered some Cosmic Shimmer Glitter Jewels – Iced Snow to the petals, LOVE the soft bling this gives the flowers. Oooh very snazzy! I also popped in some distressed organza ribbon inbetween the flowers to further soften up the arrangement and of course that silver and white twine from Hobbycraft. You’ll be pleased to know that if there’s none left on the shelves at the Silverlink branch that’s because I bought the lot . Love the colours of this card – it all came together so easily with that fab paper pad. Back tomorrow with another card from the new release. Today sees the start of the Whimsy September 2016 Release Party over in our Whimsy Stamps and Inspirations Facebook group. The Whimsy DT will be sharing sneak peeks at the new products releasing today, so pop across and join us for games, fun, and a chance to win Whimsy prizes. 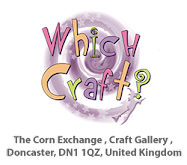 To join our release party event, just pop over to the Whimsy group any time until Friday, 14th October. I’ve made a star shaped card using the fab Clearly Holiday Sweet Treats set and the gorgeous Christmas Cheer Designer Paper Pad, and matching Christmas Cheer Enamel Dots. I used the Pierced Stars die set for the card shape. I added a corrugated star that I picked up from The Range, I think theres about ten in a pack for £1. Bargain! I also added a die cut wreath to the layers. The gold and white twine is from Hobbycraft (lurve this stuff so hard), as is the little poinsettia – another bargain at £1 for a pack of 6. I love silver and white for Christmas, throw in a bit of grey and I’m in my happy place. I picked up this Simple Stories pad from Hobbycraft the other week, it’s crammed full of icy blues and greys. I also got a few new dies from Noor Design and thought they would be perfect for this card. The dies are Find It Trading Merry Christmas die and Find It Trading Snowflake Circle die. I popped in some of those delish Glistening Berries from Noor Design into the arrangement and added some “pop” with leaves die cut from glitter card also from Hobbycraft. They’ve opened up a new store virtually on my doorstep, so between that and The Range I’m in crafty nirvana. I made the pine branches by finely cutting a strip of grey card and twisting it around a piece of wire then coating it with glossy accents and twinklets. I got this idea from the amazingly talented Pamellia Johnson, her work is just stunning. CANDY - ALPHABET DIES ANYONE? 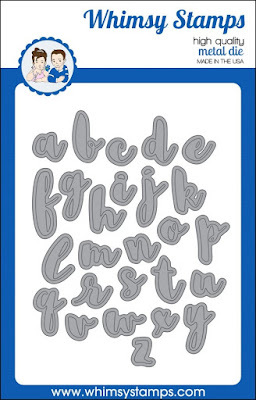 I've a set of Brush Script Lowercase Alphabet Dies from Whimsy Stamps to give away this week. As before, if you want to enter the draw leave a comment and I will draw a winner on the weekend. It took me a while to work out what I was going to do with the Big Balloons Celebrations stamps and Big Balloons Celebrations Die Set. See, I wanted a shabby looking card and well, the balloons don’t really scream shabby. But it’s amazing what paper can do to transform a set of stamps and dies from which I would first think could only be used for clean and simple to my usual more is more kind of card. I love it when an idea I have in my head turns into the exact card I was wanting to make. I used Galeria Papier As If In A Dream Retro paper pack, love the creamy pinks and greens in this pack. I die cut the balloons from matching papers in the pack and edged with Pumice Stone Distress Ink so they would pop off the card and not get lost in all the pattern. I stamped the sentiment after I had die cut the balloon using my beloved Misti. Man oh man I would be so lost without it.